The Conference will be held at the Duluth Entertainment Convention Center and the Social Studies Social will be located at Clyde Iron Works in Duluth. Price will increase to $200 after Feb. 15 @ 12pm. Rate available through Feb. 15 @ 12:00pm ONLY! 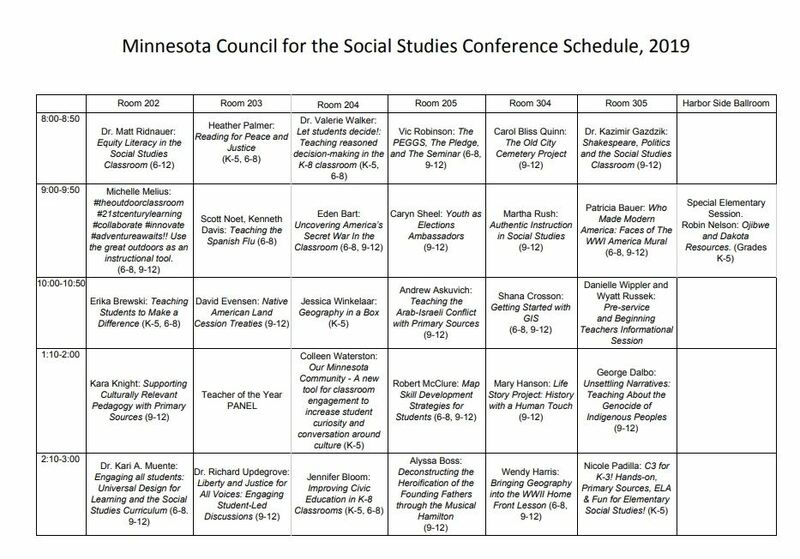 The annual MCSS conference is a professional development opportunity for Minnesota social studies teachers of all grade levels. The conference includes keynote speakers, engaging sessions on disciplines and strategies, exhibitors, and catered continental breakfast and lunch. This year's conference will be held at the Duluth Entertainment Convention Center. Registration prices are per person. The Social Studies Social is a social evening event. At the Social, MCSS honors three outstanding social studies teachers, one at each of the elementary, middle and high school level in addition to a Lifetime Achievement Award. Attendees will enjoy a catered dinner, a keynote speaker, and a wonderful opportunity to network with other social studies educators. Anyone is welcome to attend the event which will be held at the Clyde Iron Works on Sunday, March 3, 2019. Registration prices are per person. Registration deadline for the Social Studies Social closes at 12:00 p.m. on Friday, February 22, 2019. Payment: You may pay online with a major credit card or send a check payable to MCSS to: Jennifer Hansen - MCSS Treasurer, 639 17th St. SE, Owatonna, MN 55060 before Feb. 22, 2019. After that time, please bring check or cash to the conference. Cancellations: Full refunds will be issued for notifications of cancellation received on or before Feb. 8, 2019. No refund will be issued in the event of cancellation on or after Feb. 9, 2019.